The suspect ditched his bike outside the Robstown Hardware Company and ran inside. ROBSTOWN, Texas — A Bishop, Texas, man found himself behind bars again Wednesday morning after he was accused of doing pretty much the same thing he was accused of doing just a couple of weeks ago -- leading police on a chase. It was just a couple weeks back when 45-year-old Alan Baade was arrested after leading police on a chase in Driscoll, Texas, while driving a John Deere tractor. Footage of the pursuit was captured on camera by 3News. On Wednesday, police said Baade was at it again, only this time he was riding a motorcycle. According to the Bishop Police Department, officers tried to pull Baade over just after 10:15 a.m. Wednesday for traffic violations, but he refused to stop. Instead, he led police on a chase all the way to Robstown, Texas. 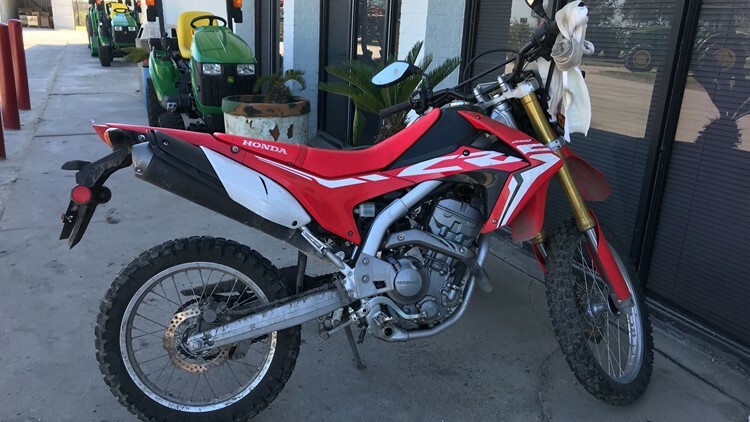 A motorcyclist was arrested Wednesday morning after police said he led them on a chase from Bishop to Robstown, Texas. Baade pulled into the Robstown Hardware Company and ditched his bike, trying to flee inside the building. Officers followed him in and apprehended him without a struggle. Now, Baade is back at the Nueces County Jail facing charges of refusing to stop and evading arrest.